Finding shoes for my little man was straightforward until he really started walking. It required me to think more about the construction of the shoes he was wearing. Robeez were nice, but too soft for outdoor use. The boots from GAP I liked had a firm sole, but seemed too clunky for learning to walk. The usual places I would buy clothes only had more of the same – fashionable, but poorly constructed shoes. This left me researching online like crazy for the perfect shoes for his growing feet. The more I searched for reviews online, the more of a chore it came to be. Turns out I was searching for the wrong thing. 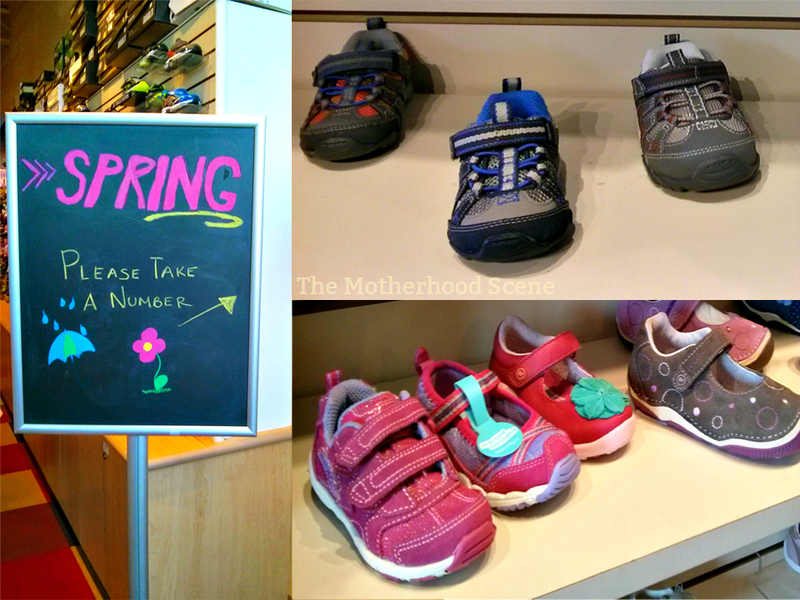 What I should have been looking for was Kids Kicks, a local specialty shoe store for kids. It’s a small store but a busy one, with attentive and helpful staff ready to help you find the right shoes. There are over sixty styles available in the infant section at Kids Kicks. The service here is incredible. I visited on a weekend so it was pretty chaotic with all the families in the store, but the staff here were calm, friendly and patient at all times. The owners have put some thought into this though – there’s a ticket dispenser at the front of the store which helps staff keep track of which customer to serve next. During busy times like weekends and back to school season, taking a ticket is critical. The store fills up quickly and it’s the only way to keep track of everyone. If you’re able to come on a weekday, mornings are usually a lot less busy. Once my ticket number flashed up on the screen at the back of the store, I was ready to go with my list of must haves: something flexible but strong enough for the outdoors, well constructed to protect growing feet and cute enough to match multiple outfits. There are a ton of styles and brands available here that meet all these needs. From a quick count, I saw over sixty styles available for boys and girls for sizes 0-8. Now here’s what I love about the staff – they took the time to measure my little one’s feet, direct me to appropriate styles and explain the features of each of the shoes that we were trying on. If I had questions about any of the products, they were able to answer my questions all while maintaining an aura of calm among a sea of stressed out parents. I was out the door in less than half an hour, and the only reason it took me so long was because I was debating between two styles. Kids Kicks really made the whole process enjoyable. Now that I’ve been here I can’t imagine going anywhere else. Cost: Infant shoes at Kids Kicks range between $35-80 a pair.